Lobus Queen and Dutches are the first to ripen. If the birds and the deer don't pick too many, we usually can expect two to three bushel from these two trees alone. 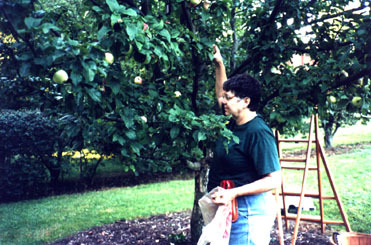 Sometime around mid-July the birds start getting into the trees and we can tell the apples are getting ripe. Sometimes when the weather is hot & humid, you can smell the apples as they ripen. The ground color has changed and the seeds in the test apples (fallen fruit) have turned dark brown or black. 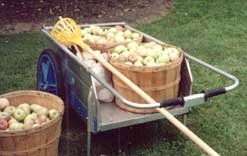 It's early morning when we get out the baskets, the folding orchard ladder & cart plus the poll picker (lying in cart) and begin the task of picking apples. Lift and twist is the best way. About 9:00 am we quit for breakfast. 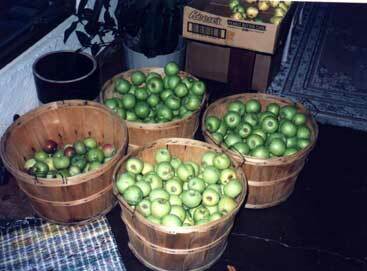 Apples by the bushel. Those bees on the roof realy helped.